The electrical energy generated at the power stations is conveyed to the consumers through a network of transmission and distribution systems. 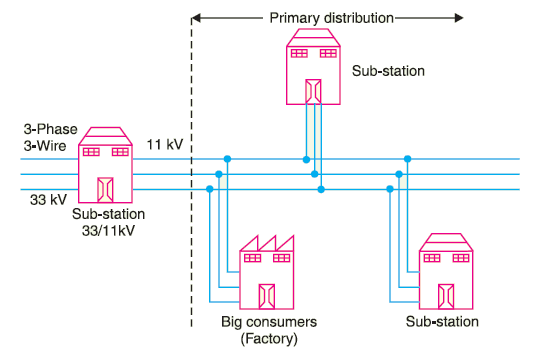 In the power system, the electrical energy generated at the power stations is conveyed to major sub-stations. From the major sub-stations, it is conveyed to the bulk power consumers by high voltage distribution system of electrical power whereas it is conveyed to the small consumers by the low voltage distribution system. Thus, the electrical power distribution system should be well planned and should be such that energy (power) can be well distributed among the consumers economically and efficiently. In this article, we shall deal with various topics which are related to the distribution system of electrical power. The part of the power system by which electric power is distributed among various consumers for their local use is known as the electrical power distribution system. In general, the electrical power distribution system is that part of the power system which conveys electric power (or energy) from major sub-stations (which are supplied by transmission lines) to the consumers as per their requirement. A low tension distribution system is shown in the figure which comprises of feeders, distributors and service mains. 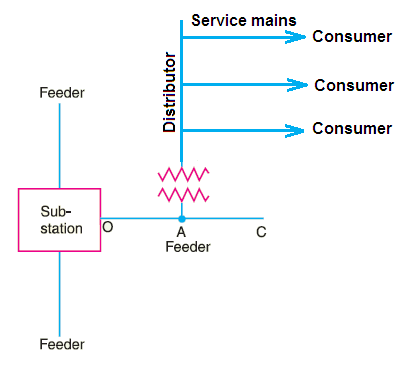 Feeder: A line or conductor which connects the major sub-station to the distributor is known as the feeder. It is to feed the electric power (or energy) to the distributor. Since no tapping is taken from the feeder, generally it carries the same current throughout its length. The current carrying capacity is the main consideration taken into account while designing a feeder. Distributor: A conductor to which various consumers are connected through service mains is known as the distributor. It is to distribute electric power (or energy) to various consumers, thus a number of tappings are taken from the distributor. Hence, it carries different currents along its length. While designing a distributor, voltage drop along the length of the distributor is the main consideration. It is because the fluctuations of the voltage at the consumer’s terminals should not increase beyond the permissible limits. 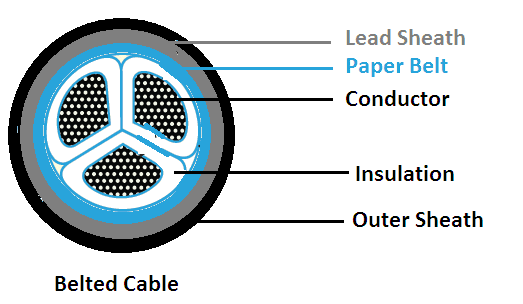 Service Mains: A line (conductor or cable) which connects the consumer to the distributor is known as service mains. It is designed as per the connected load of the consumer. AC electrical power distribution system is almost universally employed due to its several advantages over DC distribution system. Overhead system, being cheaper, is mostly employed in our country. However, underground system is employed in thickly populated areas where the overhead system may not be practicable. It is also employed in big cities because of its better look. Interconnected system is preferred because of its better reliability. Though electric power is almost exclusively generated, transmitted and distributed as AC. but for certain applications (e.g. for electrochemical works, for the operation of variable speed machinery DC motors etc and in ships) is absolutely necessary. For this purpose, AC is converted into DC and is then distributed by the 2-wire system or 3-wire system. It consists of two wires one is outgoing (positive) conductor and the other is return (negative) conductor. The loads (lamps, motors etc.) are connected in parallel between positive and negative conductor as shown in the figure. It consists of three wires, two outers (positive and negative outer) and a middle or neutral wire which is earthed. The voltage between any outer and neutral is V, whereas voltage between the two outers is twice to this value i.e. 2V. Thus two voltages are available to the consumers. The lamp loads (low voltage loads) are connected between any outer and the neutral, whereas the motor loads (high voltage loads) are connected across the two outer as shown in fig. The current flowing through the neutral is very small (only unbalance current which will be zero when the load is balanced), therefore, generally area of the cross-section of neutral is taken half as compared to either of the outer. The bulk consumers are supplied generally at high voltage (11 kV) and the system by which they are supplied is called primary distribution system of electrical power. Bulk consumers install their own transformer to step-down the voltage for utilization of electric power. The primary distribution is carried out by 3-phase, 3-wire system due to economic considerations. A typical primary electrical power distribution system is shown in the figure. Elect power is received at high voltage (say 33 kV) by the substation located at the outskirt of the city, where the voltage is stepped-down to 11 kV. This 11 kV primary distributor is run along the various routes in the city. The bulk consumers and low voltage (400 V) distribution substations are supplied by the primary distributors. The small consumers are supplied at low voltage (400/230 V) and the system by which they are supplied is called secondary distribution system of electrical power. The secondary distribution employs 400/230 V, 3-phase, 4-wire system. Where 400 V is the line voltage and 230 V is the phase voltage. A typical secondary electrical power distribution system is shown in the figure. The primary distributor delivers power to a distribution substation, where a 3-phase, delta/star, distribution transformer steps down the voltage from 11 kV to 400 V.
The low voltage secondary distributor (3-phase, 4-wire) is run along the streets of the area to be fed by it. 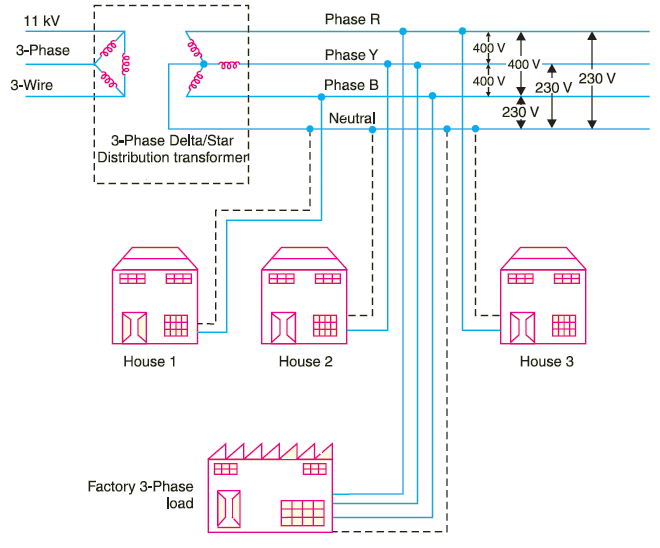 The 1-phase domestic loads are connected between any one phase and neutral whereas 3-phase, 400 V motor loads are connected across 3-phase lines.